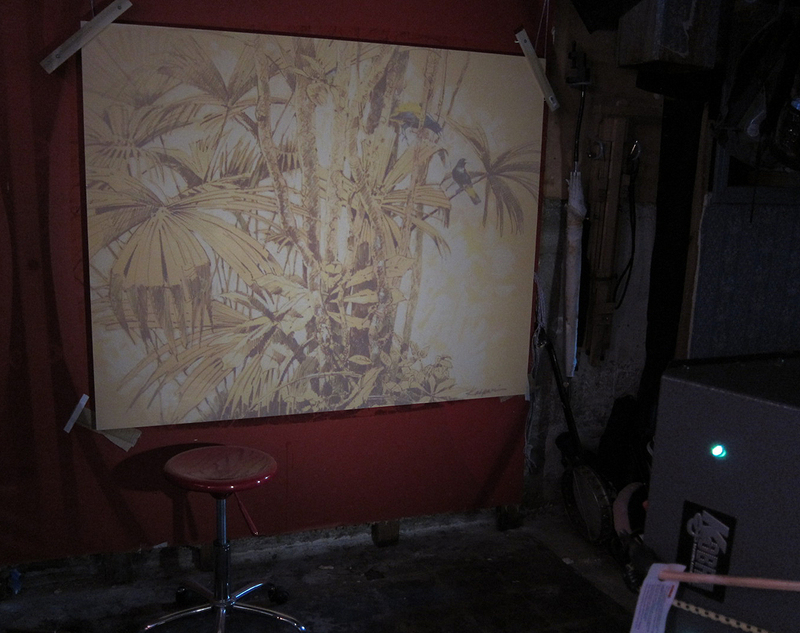 Palms and caciques, being projected onto a 5'x 4' panel. It pays to have a good business sense if you want to survive as an artist. 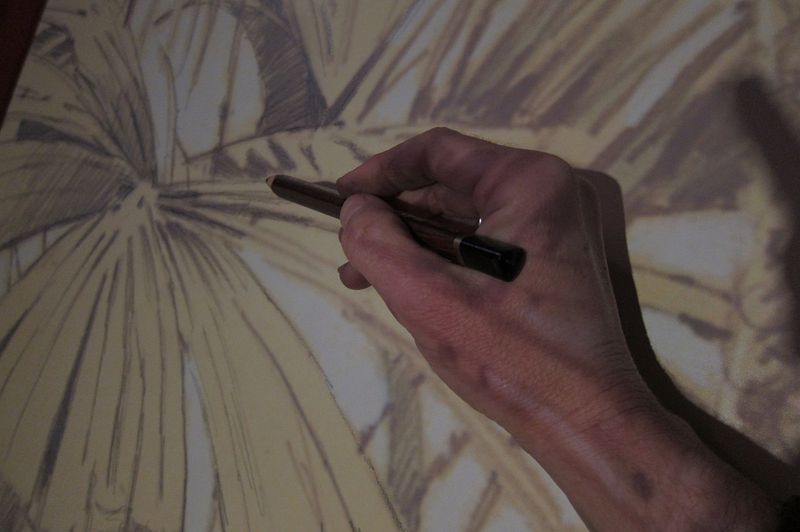 A lot of us are working on smaller, more affordable paintings to tide us over until the next major art boom. That said, I have an urge to go in the opposite direction of conventional wisdom, as usual, and this week I’m living large. As in large art. 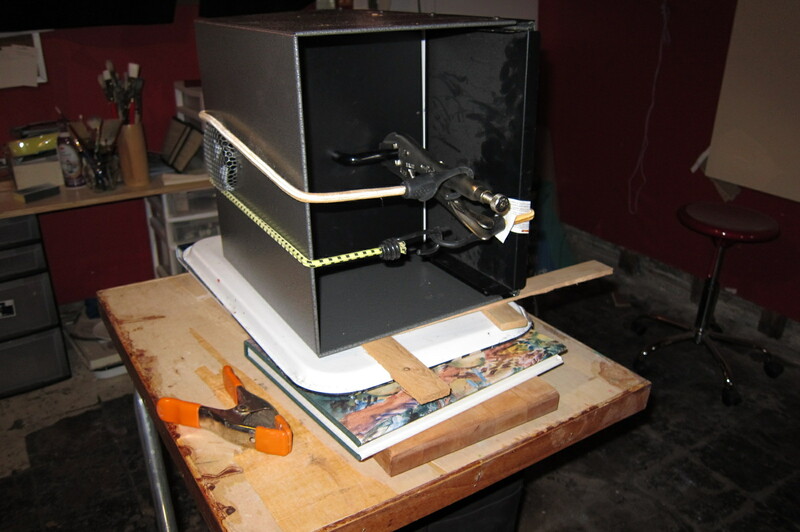 Projector set-up with vice-grips and bungee cords holding the image tray steady. Note the props under the projector, and the wood shims inserted to even up the base. 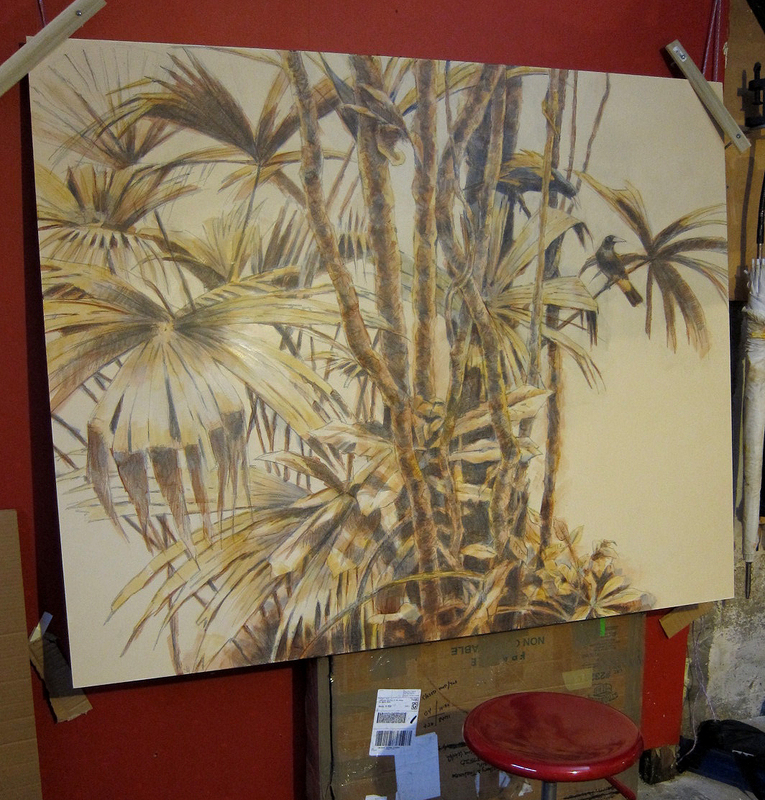 Some very nice plein air drawings I did in Panama would make a real statement if they were a little bigger, I thought. I wanted to give the viewer a sense of being shoved head-first into the habitat. 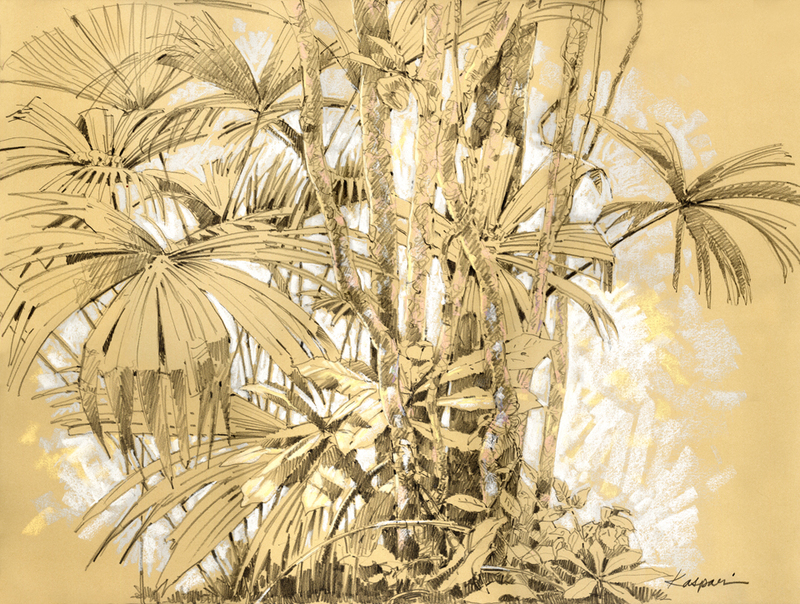 One of my favorite pieces was a sweet little a pastel/graphite drawing of a stand of Carludovica palmata, the Panama Hat palm. To make it more interesting I snuck in a couple of yellow rumped caciques. They were sketched from life in the Peruvian Amazon a couple of years ago, but are also found in Panama. So far, so good. 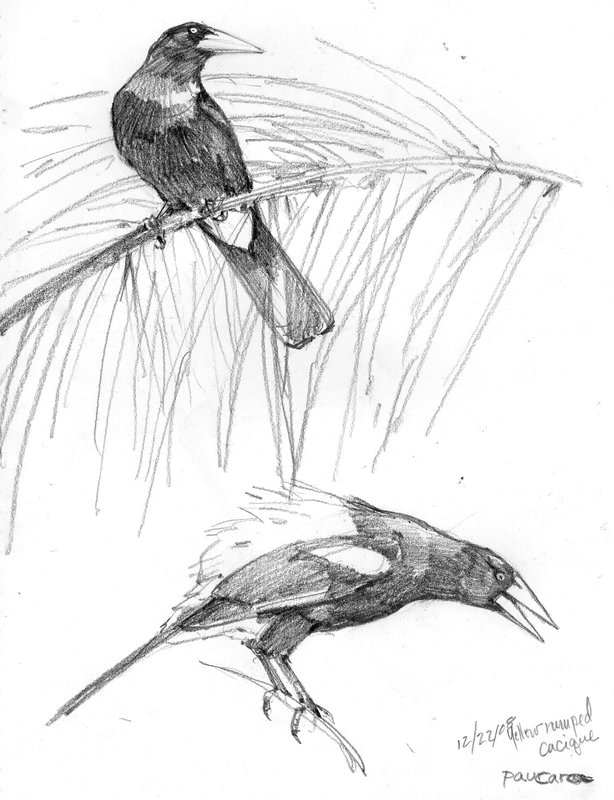 Yellow-rumped caciques, sketched in Peru. 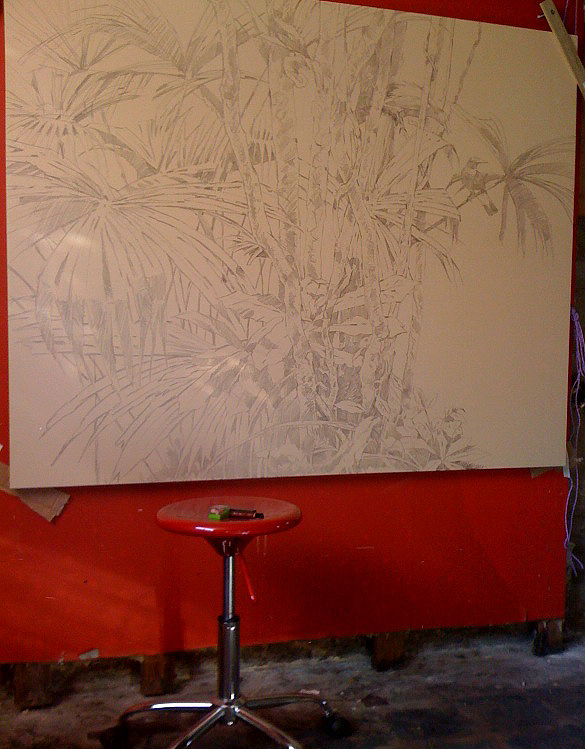 There are always technical details to work out with a large piece. The panel, built by a local artisan, had to be delivered by truck. It took two of us to carry it downstairs. We laid it flat on sawhorses where I could roll on about a gallon of acrylic gesso, sanding it smooth between lots of coats. Next it had to be raised vertically against the wall, hoisted with rope and eyescrews- easy to raise and lower for projection. Wood slats at the upper corners pressed it back flat and held it steady. Projection commenced after I figured out how to stabilize the projector tray holding the drawing (actually, a printout, not the original). Vice-grips and bungee cords did the trick on that account. All these technical details are a pain, but once I got them straightened out, the drawing went fast. I listened to my home recordings of tropical birds and monkeys which put me in the right frame of mind (even if it’s winter outside and not much warmer in my unheated basement). 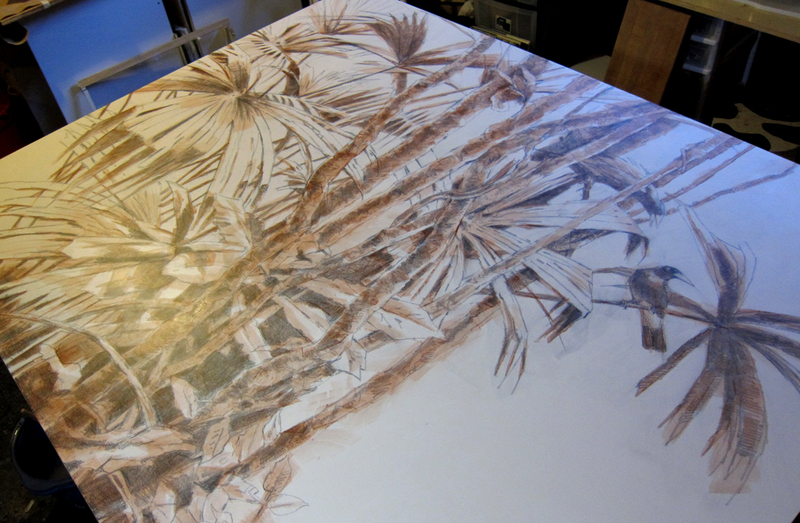 Next step: a series of color washes over the drawing, which will remain visible under the acrylic tints. It’s not a painting, not a drawing- it’s something in between. I just wanted to say hello and thank you for the blog. I am an artist currently on sabbatical in Thailand and you’ve given me further inspiration for my work which includes drawing on location, writing a textbook about gesture, and blogging with my students back home! Are you done? Is there more? I’m so curious about this. Not a painting, not a drawing….As a fellow artists (watercolor) I’m always interested in the technical aspect of special pieces like this. I did a 4’X5′ commission (acrylic) of a quilt this fall and had to come up with special means of projecting the image and then tracing. ‘Twas a pain, as you say.